More mystery & theories – Hello Korea ! I’ve never been good at solving mysteries, and so this is keeping me awake. notice how my age is much heavier than all the other writing on this document, as if it has been written over and changed from a "2" to a "3." Also, Kim Sook Ja’s name is written in different handwriting. WHY would someone add another child to my document and then CHANGE my age to something older? A whole year older? I asked Mrs. Seol how she could know Kim Sook Ja was younger than me by 6 months, and she told us that children’s ages were estimated by their physical examination and usually the number of teeth they have. It says in my medical report documents that I had 16 teeth. That would place me at 13 to 19 months age. Clearly, with no Second Molar, I was probably not already two years old. So WHY would they list us as the same age? Kim Sook Ja’s photo clearly shows she is at least a year older than me. (if not older) A year’s difference between children at that time in development is HUGE. It seems to me that the age discrepancy on the document was intentional. In most cases I have heard of an orphan’s age being changed, it is changed to a younger date to make the child more desirable for adoption. So to change me to a year older at such a young stage in development is bizarre, as more adoptive parents would rather have a 14-18 month old than a 24+ month old child. Unless perhaps there was some child identity swapping going on? This little document just gets weirder and weirder every time I look at it. And what of my birth family appeals? I was broadcasting my age as written, and whoever my family was/is would have dismissed it as me if it was a WHOLE YEAR OFF. You definitely look to be well under 24 months in that photo. I’d always suppressed that suspicion, and because I have always been so small, (I’m just under 4′-11″ even right now) I always wrote it off to being petite. 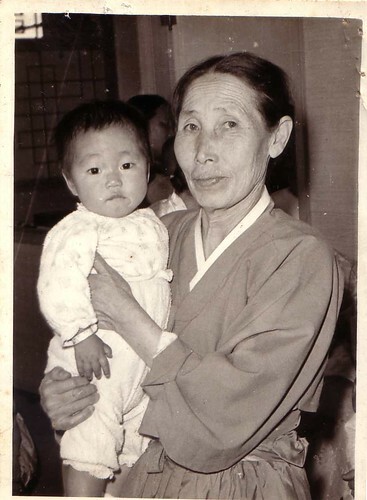 But there are many many petite Koreans my age, and all the Koreans I’ve met say there’s no way I’m 2 years old in that photo. Just the shape of your face and head. Looking at photos of babies I’ve known, including my sons, seems to support this. You remind me there of my now seven year old at about 14 months. ha ha!!! You’re right – all children that age have heads like Charlie Brown!